Home sales in Tallahassee through June were up 4.3% over last year, and that is no minor victory. 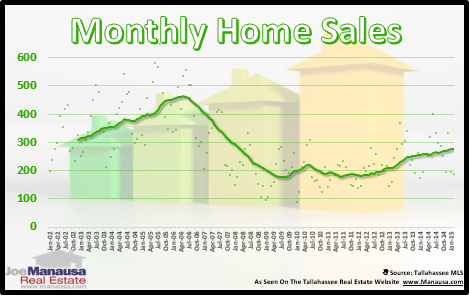 During this same time last year, we reported home sales had grown 33% over 2012, the largest jump at the mid-year that I have reported in 23 years of monitoring the Tallahassee real estate market. So the fact that we continued to grow this year without "giving some of it back" is excellent news for a housing market in recovery. But as good as the news appears to be, you might be surprised by the upside that remains in the market. 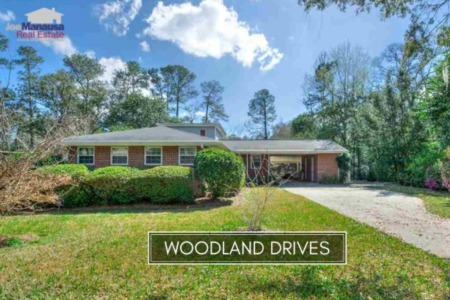 In the real estate graph below, we track the total number of home sales in Tallahassee. Single family detached home sales are shown in the dark red color, while condominium and townhouses sales are collectively shown in the light red color. With 2020 homes sold through June, it's the best mid-year report we've seen since 2007. While the market recovery is well under way, it is important to note that the average number of homes sold through June in the previous 23 years was 2,463. Reminder: Our one-page weekly special went out this morning. 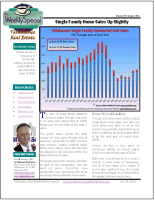 You can download your free copy by clicking on the image to the right, or by receiving it every Monday when it is published by subscribing to the Tallahassee Real Estate Newsletter. That means this year's number of homes sold through June is still 18% below average. Considering our population has grown significantly over that period of time, the upside of the market is far more than the 18% that we have left behind. Using rough approximations, that means our market is still running about 100 home sales per month slower than what a non-cyclical market would deliver. 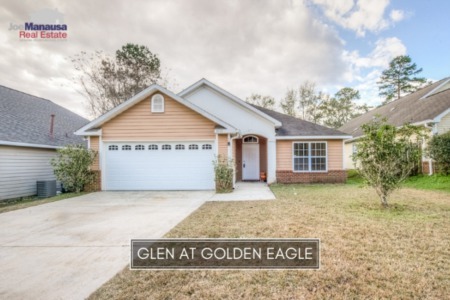 That's good news for the future of Tallahassee housing. We might still have some ups and downs over the next ten years, but ultimately we should expect "normalcy" to return and the number of homes selling each year should rise. If you would like to know how your home might fare in today's real estate market, just drop me a note and we'll schedule a time for a full analysis of your home and what you should expect to net from a sale.